What I should be musing is an IV bag full of fluids. Holy. Dehydration. Lord have mercy. The heat has hit me and I feel as though I will never acclimate. I have Stella with a heat rash. I have a bed of zinnias that are sitting in the purgatory stages of death. They may make it and they may go towards the light. No one can say right now. I have myself whining and insisting to be indoors with a non-negotiable temperature of 70 degrees. Mine sounds less extreme of the 3. Hmmm. Maybe I am loving otomi so much due to the climate, and I was starting to think I live in Mexico. Oh wait I don't. Maybe it is due to heat exhaustion? Who can say? All I know is that I love me some otomi and I do not care who knows it. 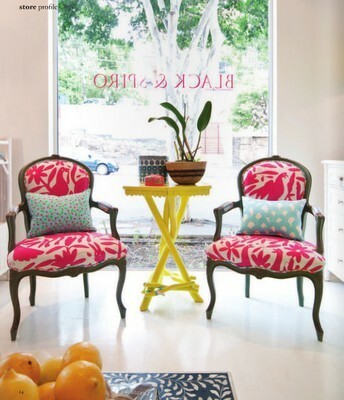 Otomi brings such a whimsical and cultural feel to any space. 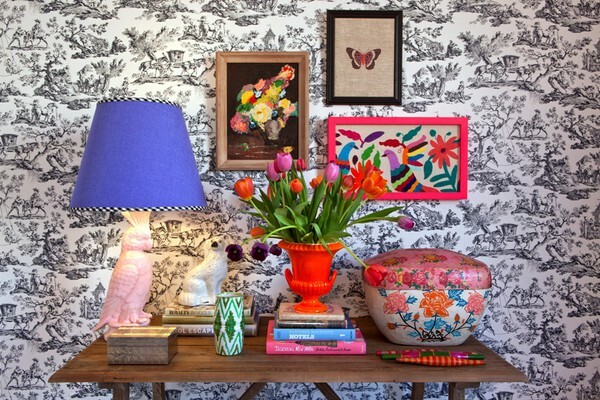 I love the bold color and the usage of animals throughout the pattern. Duh. Let's get our otomi on. You are a designer genius. I love your mixture of classic pieces with fun and funky accessories. Will you please come and show my abode a thing or two? Liz Caan kicking it in her perfectly otomi decorated space. Love her and her little one. Look at those miniature Hunter boots. Get out. And no one does otomi like Ms. Spiro. I die over each and everyone of her perfectly otomi styled spaces. If I ever get the chance to travel to Australia, my first stop from the airport will be Black and Spiro. That my friends, is called a mental illness. Mmmmkay? 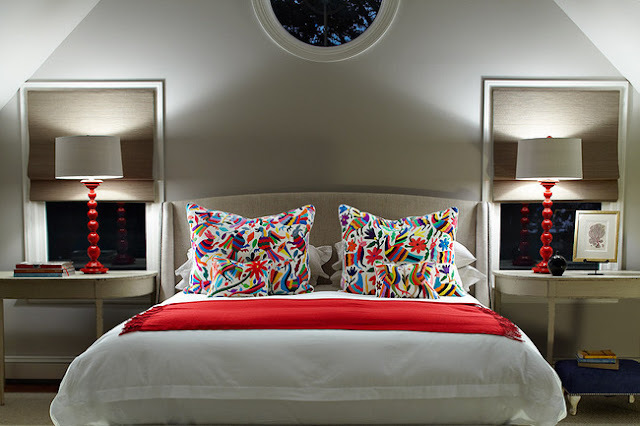 A very refined modern space that is definitely funked up with some otomi. I cannot tell you how much I am drawn to the sleekness of this room juxtaposed by bright color and an ethnic otomi pattern. Winner. This whole house inspires me to be on vacation forever. Marshall Watson designed this easy living vacation home in Cabo. He used forever classic pieces and again, juxtaposed them with culturally appropriate accessories. Hello kelly green otomi. I love you. 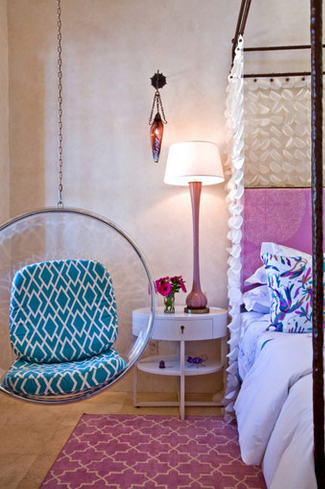 Adoring this pink room in the same Cabo getaway spot. Rest assured this is not a room for a boy and it should not be. And another angle. This room absolutely slays me. Lucky girl. 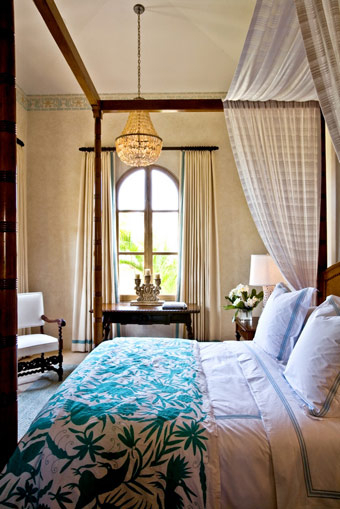 A fabulous guest room turned dressing room. 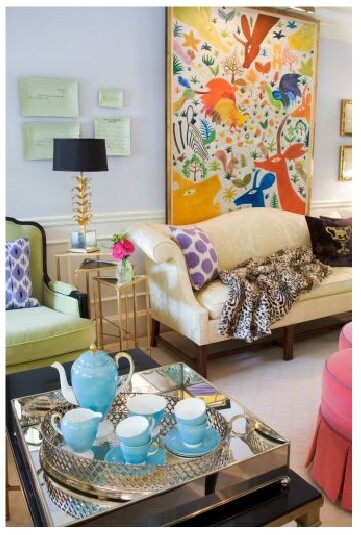 I can totally relate aside from the fabulous wall sized mirror and the perfectly otomi couch. I need a shoe wall. It has been decided. How could we finish this one off without some otomi fashion? Love this fun spin on a Summer dress. This girl needs to add this to her collection. So what do we think dolls? 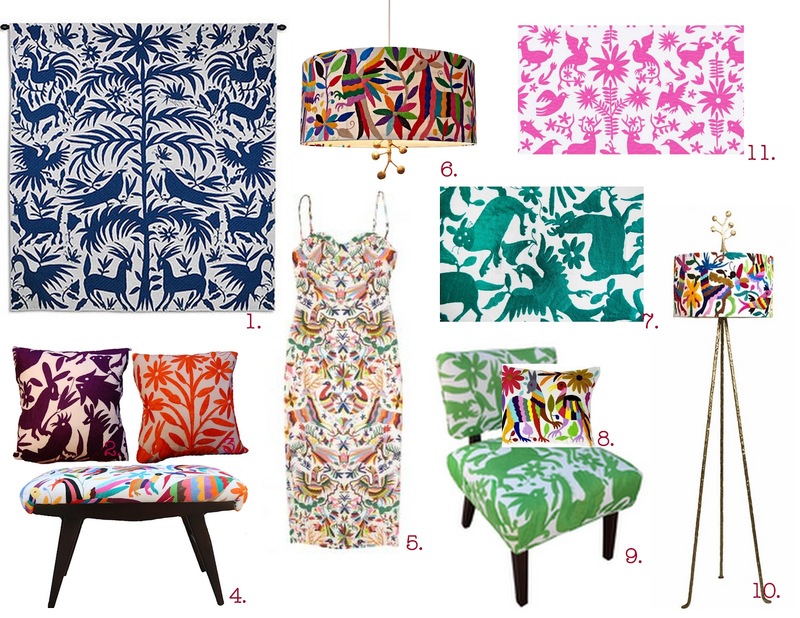 Do we want to add some otomi to your home or wardrobe? I sure do. 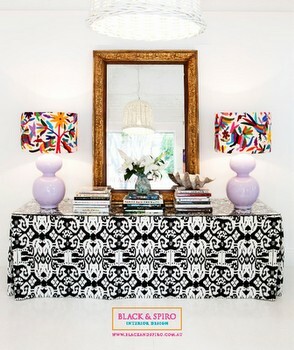 Love the otomi! Especially the first image and now I need a pair of little Hunter Boots for my little man. And the heat is draining me too, looks like an indoors kind of week! Very cute. I love the fabric on a dress! I think it adds the perfect punch to a room. I love it, too. Good luck with battling the heat. It is stupid hot! Happy 4th to you. i think the jacaranda ottoman needs to find its way into your new home! juuuuuust sayin. I have a multicolored one, and am stuck with how to use it. This post re-invigorates me, though, to consider my options! Love the stencil- such a good find! ...agreed. I need a shoe wall too! 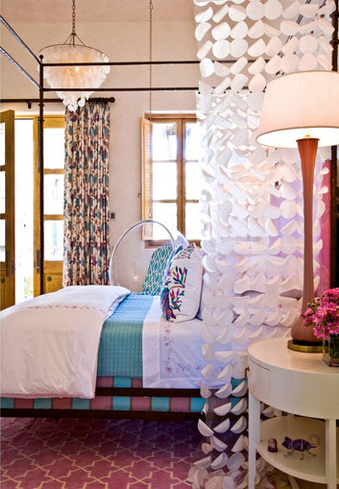 that canopy thing over the bed that looks like white flower petals SLAYS me... that was Awesome!!!!!! did you lose power or anything? how did the RIC fare in the storms?? Oh holy cow this designer is right up my alley! Bout to go buck wild on pinterest! I am in love with that leopard blanket on the sofa! Hate to tell you this, but my husband came home, found the house to be sitting at 69 degrees, and promptly turned on the heat. We could use some sun/heat where I am (Vancouver, BC). You could so DIY that wall art in the first image. Do it. Do it. Okay, just catching up on all your fabulous posts and couldn't help but stop at this one. I just grabbed an Otomi wall hanging (the multi-colored one) from an estate sale, and I'm in love. Don't know where it will live yet, but I'm thinking my daughter's room. Can't get enough of these beautiful images. Thanks for the inspiration as always!